I was still feeling a little drained after captain jack so I’ve been picking up little projects as I slowly work on my next big one. That basically translates to easy pokemon patterns. It just so happens that this cute little fella is among my favorites and I had the colors so I finished him up in a few days. 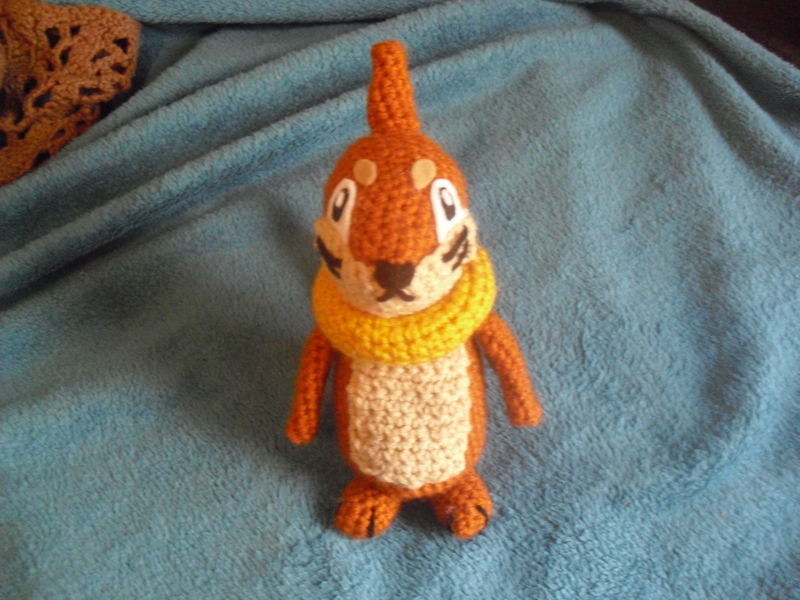 His pattern is pretty straightforward but if you have any questions or find mistakes feel free to leave a comment! I hope you like it! Begin to stuff. I would recommend stuffing the body with something heavy so it will stand up better. It will stand up without the added weight but it takes a little work if not stuffed with the other weight. Round 1: chain 16, sc in 2nd chain from hook , sc in next 13 chains, 2 sc in last chain. 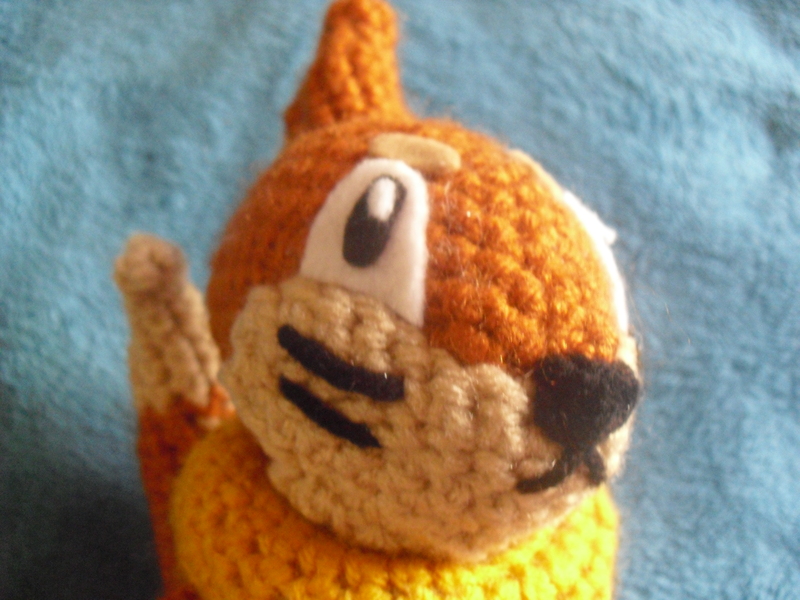 Continue with your rounds until it wraps around buizel’s neck and then attach together. 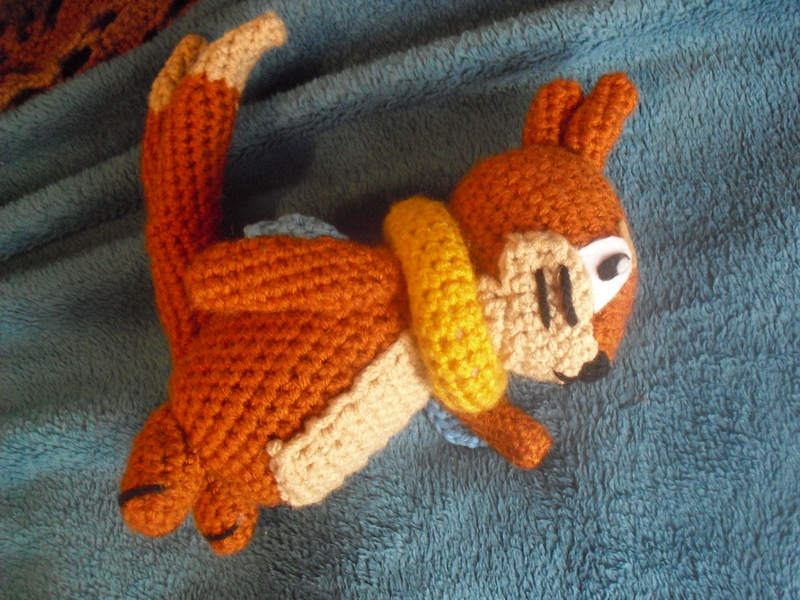 I started out with the body and sewed on the arms, legs and tail. I then attached the head and placed the intertube over top of the head after smooshing. However, I don’t recommend doing this and this can be done after the head is already attached and just sewing it around the head rather than just sewing it together and realizing it doesn’t fit around the head. this is awesome! I love it! I know you probally dont take requests but can you make victini? I do from time to time take requests. What I make I usually choose at the last minute, from what people have suggested to what colors of yarn I have. I am already working on another pokemon, but that one is up near the top of my list. The hole on the head should be closed off, it’s not attached to anything. The head is almost horizontal on the body but at a slant. If that doesn’t help I can try to take a picture or something and post it. Ohh, okay. I think my confusion is arising from, say Round 19 which ends the head, but there are still 10 sc in that round, so i have a hole with a 10 sc circumference. Am i supposed to do an extra implied step that pulls those 10 sc shut somehow? Is that what f/o is? >.> Sorry, like I said I’m still learning =] thanks for the help. yeah, you should close it off. I’ll have to go back and make sure I make that clearer. Awesome. As for the body, what do you make the little 2-row collar for? Okay, sorry I’m so confused haha. I really appreciate your help. What’s the purpose of it though? What is it used for so I know when it’s done?